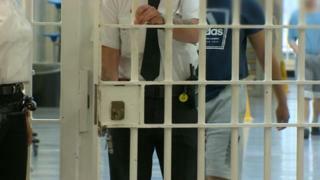 Plans for a £3m investment in prisons in England and Wales will make the system safer, the government has said. The Ministry of Justice said the money would include £2m for 5,600 body-worn cameras, giving all prison officers access to the devices, and £1m for police-style handcuffs and restraints. Four prisons will also trial the use of incapacitant spray to subdue armed prisoners safely. The Prison Officers Association said the measures were "long overdue". It comes after an investment in 24-hour patrol dogs, CCTV cameras, mobile phone detection technology, and metal detectors - as well as 1,290 extra prison officers - designed to combat an "influx of violence" in prisons, the MoJ said. The MoJ said the body-worn cameras would "act as a visible deterrent against violence" and would "assist in prosecutions against those who commit crimes in jails". The roll-out follows a successful trial of cameras in 22 institutions across the country, as well as their adoption by the Metropolitan Police. "The new restraints will reduce the need for staff to use physical holds to control aggressive prisoners, improving safety for both staff and prisoners," the MoJ added. What is going wrong in prisons? Sam Gyimah, the prisons minister, said: "This latest investment underlines our commitment to transform our prisons into places of safety." The plans were "welcomed" by the Prison Officers Association, which described them as "long overdue". It said new restraints were "essential" for making prisons safer but that the measures did not go far enough and more needed to be done to reduce violence. Cameras and restraints should be made available as quickly as possible, but the best way to make prisons safer would be to reduce populations, control overcrowding and recruit more prison officers.